In a little over a week, I have friends from out of state coming in town for the Tough Mudder in Maysville. They're staying with me in Lexington, and I have a very short amount of time to convince them how amazing this city is. Here are some of my initial ideas. Consider using them if you're trying to entertain guests this fall! I mean, you know that'd be the first thing on anyone's list, right? Thankfully, the Fall Meet runs through October 26th on all days except Monday and Tuesday. First race post time is 1:05 pm daily. 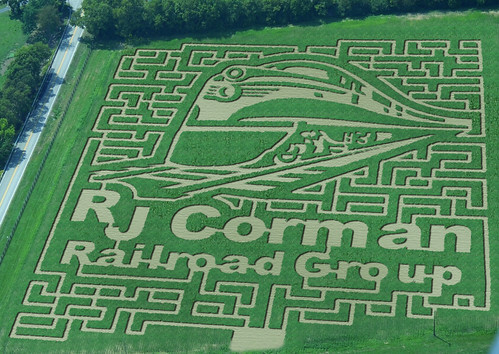 This year's corn maze at Kelley Farms just out Old Richmond Road in Lexington is a tribute to R.J. Corman. Corman was a Nicholasville native and backhoe operator turned railway magnate. He passed earlier this year, and this is a great tribute. Kelley Farms has the corn maze, goats, hayrides, yummy festival food, pumpkins, and more. The farm is open through October 26th. Hours and prices are on their website. Going on a tour of at least one distillery is a must-do for visitors and residents alike, but seasonally appropriate is the Ghost Tour at Buffalo Trace. These night time tours are equal parts spooky and interesting. The tours run Thurs-Sat at 7pm, and last 1 hour. Reservations must be made well in advance. As much as I love my friends, I don't like cooking 3 meals a day for groups. A list of non-chain restaurants is always handy in these occasions. Maybe we'll stop by Nick Ryan's Saloon for The Stirrup Cup Hot Brown plus a little flavor of downtown. Or we could head to my favorite place for southern diner food plus a piece of Missy's Pies: Ramesy's. For a completely different environment, we might go to Shakespeare & Company (photo above) downtown. And if we want some of the best brunch around, a trip to Winchell's on Southland Drive will be on the agenda. Elvis Pancakes, perhaps? What other fun visitors ideas do you have? In "buffalo trace", "emily", "keeneland", "lexington", "ramsey's"
Summer in Lexington means patio dining at my favorite local diners. Ramsey's. Go to the original at High and Woodland. Order the fried green tomatoes. Stella's. The best hamburger in Lexington. What are your favorite summertime diners? In "lexington", "photos", "ramsey's", "restaurants", "stella's kentucky deli"